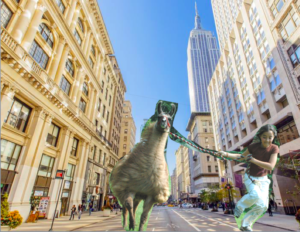 BREAKING: CAMP LLAMAS LOOSE IN NYC! Good morning, HVC! Hummingbird reporting here live from the Valley News Headquarters (located in the Video Loft upstairs in the Red Barn) to bring you this breaking report. 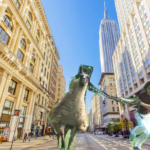 It seems the llamas escaped from the llama pen in the early hours of this morning in disguise, chartered the Candy Drop Plane to fly them from Maine to New York City, and spent the day exploring all the best of fine dining, culture, and recreation that the city has to offer. Camp directors Peter and Meg Kassen woke for their daily trip to the lake to find Hamilton the pig, longtime resident of the llama pen, alone in his habitat. 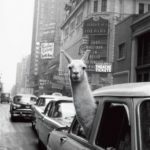 Hamilton informed the concerned Kassens that, though he had tried to stop the llamas, Cricket and the gang insisted they needed a break from all the stress of rural life; that they craved the feel of paved roads under their hooves; and that their species’ origins in the Andean mountains of South America required they reach a certain altitude that only the Candy Drop Plane could achieve. 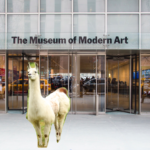 New York-based campers first reported seeing the llamas clomp into the MoMA at approximately 9:43 this morning, EST. 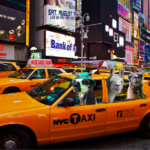 The next report came from midtown, where the llamas were spotted stepping out of a cab to attend a matinee of Hamilton. Several hours later they were seen and (unfortunately) heard recreating “The Battle of Yorktown” in Times Square. According to an eyewitness, they were allegedly rehearsing to bring the show back to HVC’s own Hamilton the pig upon their return to the Valley. 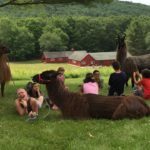 To gain some insight into this unique llama behavior I spoke with former HVC Llama Mama, Robin Harris (featured in a photograph below, enjoying some shade with campers and llama pals). 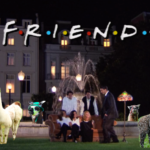 Robin reported that Blackberry and Stanley had mentioned a desire to get a nibble of the famous trees of Central Park, and speculates that the taste for gourmet greens may have enticed the llamas to New York. 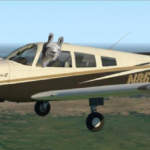 Most recent reports claim the llamas have boarded the Candy Drop Plane once again. 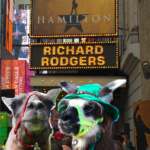 They are expected to land in Belfast, Maine later this evening, where they will be escorted back to camp by Robin, the Kassens, and an ornery Hamilton, who is anticipating sitting through the llamas’ rendering of an entire Broadway show. Many thanks to our camper correspondents and Robin Harris for their insights as this story has unfolded. Oh, and also… APRIL FOOLS!!! I hear there’s a Van Gogh in here! This entry was filed under News Reports, Uncategorized.